@konjow Just doing testing shooting at a lightbulb I was surprised by how much the Highlight Recovery could bring back even on 12:1 BRAW. Went down to the riverfront on a foggy night to play around with BRAW a bit. It's really great to be able to shoot on normal SD cards and still have so much latitude to push the footage around. This is BRAW 12:1 4K24 DCI. @Firworks What size and speed rating was the SD card you were using? Really thinking about taking the plunge on the camera... Thanks! @tcarretti it was a SanDisk Extreme Pro 95MB/s V30 128GB card. It's a pretty janky camera but it's a fun janky camera that captures some wonderful colors that at least I don't know how to coerce from my G85. @flash if you're asking that because of my bridge shot... I just missed focus... But I thought it looked nice enough to put up anyhow. I wish you could punch in more than 2x. I think that would have helped. @Firworks Thanks for the quick reply. I've got a GH5 and a G85 as well, but I'm really liking the footage I've been seeing over the past couple of days since BRAW was released. When you say "janky", do you mean that the camera seems unreliable, or just hard to work with? I realize it's definitely not a run and gun solution, but I thought for locked down shots and the ability to push the footage so far in post might be another great tool to add to the kit. Also getting the full version of Davinci Resolve Studio included seems to sweeten the deal as well. Any thoughts or advice coming from someone that has been working with the camera that is not a paid reviewer is really greatly appreciated. Thanks again! @tcaretti Yeah it's a bit unreliable. It's still a great camera but you just have to accept that sometimes it'll die when the battery meter says 75% or sometimes when you plug in your SSD it wont show up and you will have to try power cycling the camera and unplugging and replugging it to get it to show up. Sometimes the lens setting display will be wrong (when zooming on a non fixed-aperture lens). Sometimes your lens may not make perfect contact with the body and you've got to remount it to get aperture control working. There are just a lot of little quirks that mean that I would most likely want a second body like a G85/GH5 if I were doing paid work and had to get the shot. But in some ways it feels MORE reliable than a Panasonic camera as well. One thing that has cost me a lot of good shots and drives me nuts is how the Panasonics will stop recording at the drop of a hat. At least on the G85 if you plug in or unplug HDMI it will stop recording. Well when you're using long runs of micro HDMI cables and they get slightly nudged and it causes one of the cameras in your multicam setup to stop recording it's a big problem. Also moving the mode dial or many other actions on the camera will stop them from recording. On the P4K if you start it recording it stays recording until you tell it to stop. I've tested plugging and unplugging HDMI both starting with it unplugged and plugged in. Nothing makes it stop recording. You've also got a big red tally light on the front so you know for sure it's still rolling. Designed for the Blackmagic Pocket Cinema Camera 4K, the new Pocket Camera Battery Grip lets customers replace the camera's standard LP-E6 battery with two L-series batteries so they can shoot for over 2 hours on a single charge. It's perfect for anyone that needs to shoot for extended periods of time. Featuring a unique carbon fiber design, non-slip hand grips, and a slide out tray that holds 2 L-series batteries, the Pocket Camera Battery Grip also makes it easier to hold the camera on longer shoots. L-Series batteries are standard batteries used for a variety of professional lighting equipment, so they're readily available. Customers can even charge the batteries in the grip via the camera's 12V DC connection in between takes. 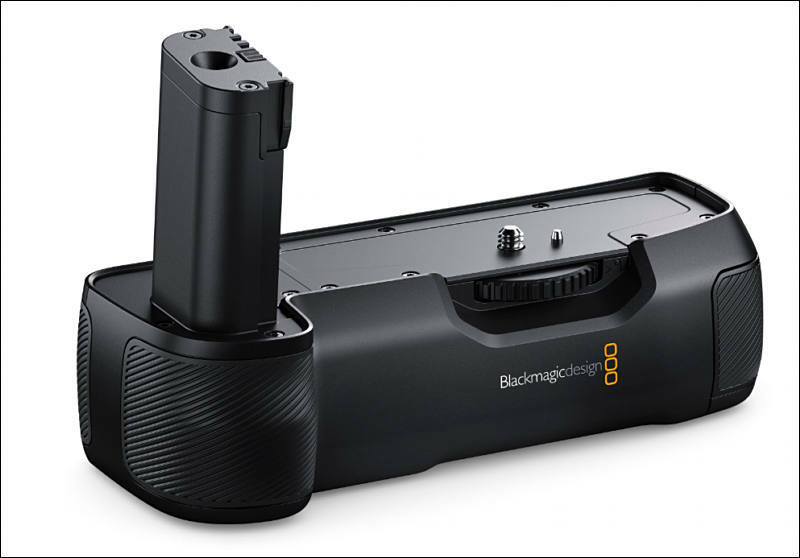 Unlike traditional external battery packs that hang off the side of the camera, the Pocket Camera Battery Grip has a unique design that makes it part of the Blackmagic Pocket Cinema Camera 4K. Simply remove the detachable LP-E6 battery door cover from the camera, slide the pocket grip in and lock it into place. There's even a storage slot built into the grip for the battery door cover. Because the Pocket Camera Battery Grip becomes part of the camera, customers get larger non-slip hand grips that make holding the camera even easier. Best of all, there's no extra gear hanging off the camera so customers still have a compact camera that can go anywhere. 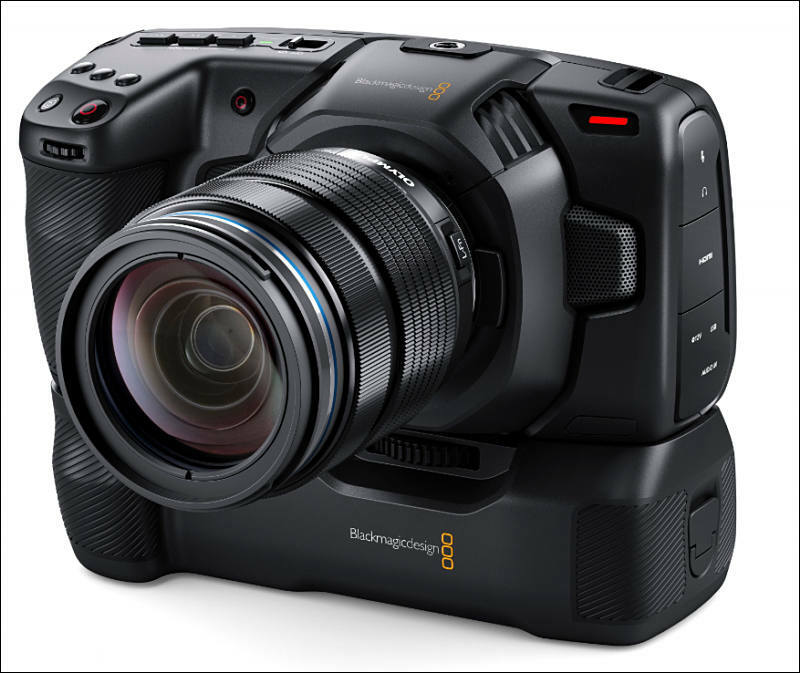 "The Blackmagic Pocket Cinema Camera 4K has been received incredibly well by our customers because it's not a dumbed down consumer product, but it is a true digital film camera with incredibly advanced features generally only found on the most expensive cameras available," said Grant Petty, Blackmagic Design CEO. "The new Pocket Battery Grip is exciting because it lets you power external flash disks allowing customers to record to the disk used for editing. It will even power the camera for over 2 hours on a single charge. As it's designed to integrate into the cameras design, it's more comfortable to hold the camera on longer shoots. Unlike regular external battery packs that hang off the camera, the Pocket Camera Battery Grip is integrated into the cameras design itself, so it doesn't add a lot of weight and it fits perfectly!" Thunderstorm near Edithburg South Australia. Rolling shutter performance of P4K for 4K-50P & 4K-25P shooting. Video was shot in Prores 422 & HQ format to a Samsung T5 SSD. Overall it has pretty good image quality and low light performance... Footage I shot also included 1080-25P and 1080-100P but I have just included the 4K files for this demo... You can see rolling shutter artefacts in some of the frames but I would say this camera is awesome for this type of work. All footage was exported from Adobe After Effects CS5 as 1080-25P Cineform files and then uploaded as a 720-25P MP4 file.